If cheap carpet installation is what you’re looking for, you have come to the right place. Get your free in-home estimate scheduled with us today and find the carpet and prices you want. With The Carpet Guys at your side, all the stresses of buying new carpet fade away. Getting new carpeting installed in your home does not have to be complicated. Book your free estimate and let The Carpet Guys make it easy on you. Plush Carpet – If your home sports a more formal and sophisticated look, then Plush carpet will be the perfect fit. Dress your rooms with a look and feel of absolute luxury. Frieze Carpet – If you like to show off a more casual and informal look, then Frieze carpet is the style of choice. It’s tightly wound fibers will offer the perfect amount of durability and personality. Berber Carpet - For any home that has a lot of hustle and bustle throughout the day, then Berber carpet will be a great addition. It comes in cozy earth tones, masks dirt intrusion, and wears very well. Looped Carpet – If you would like to add a little extra interest underfoot, then looped carpet is what you’ll want. Its multi-leveled make up will intrigue all of your visitors. Ready to get new carpet installed in your home? 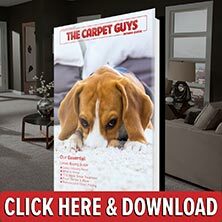 Book your free carpet installation estimate with us and get started today. We look forward to hearing from you soon.